The following art project is relatively simple, fun and educational. A pet bird can be brought to class for this art project. Live-drawing can be fun especially if it doesn't sit still for more than 2 seconds. 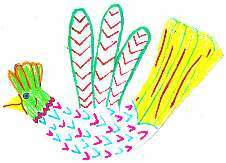 Ask your students to draw the bird first, they can paint or colour in their drawing afterwards.